Every summer, this stand-up paddle boarding race series gets both elite and recreational athletes racing in beautiful destinations all over the province. Race start at Cadboro Bay. Photo courtesy Bluegiraffe Photography. For the last seven summers, stand-up paddle boarders of all levels have travelled around British Columbia to participate in the BC SUP Cup. 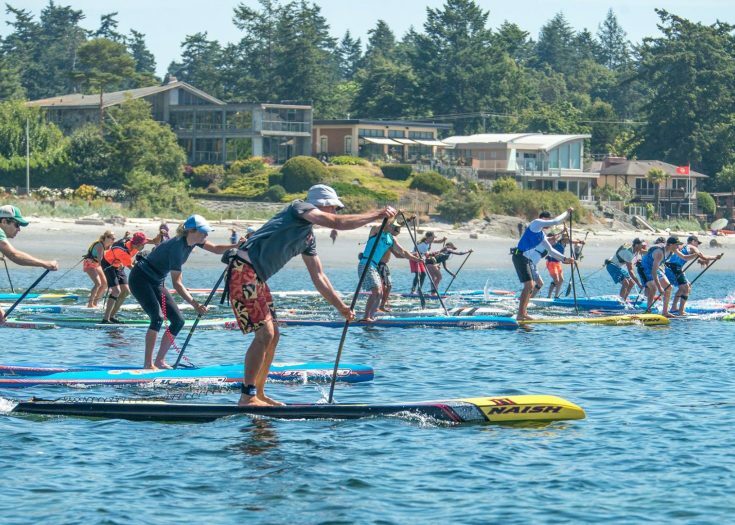 This stand-up paddle boarding (SUP) race series is open to all, with events running everywhere from the long, sandy beaches of Tofino, to the calm, secluded inlets around North Vancouver, to the sparkling lakes in the Okanagan Valley. The series launched in 2012, back when stand-up paddle boarding was still relatively new to BC’s water-sport scene. The goals of the province-wide race series are to bring seasoned and recreational paddlers from across British Columbia together for some friendly competition, to build the SUP community across the province and, since kids can race, to develop and encourage young talent. Initially a three-event series, the BC SUP Cup now includes five events between May and August. Race locations aren’t necessarily the same each year; since its inception, the series has included races in freshwater, ocean, rivers and surf. In a way, the series exposes participating athletes to all BC has to offer. This year’s first event took place on May 12 in North Vancouver’s Deep Cove, and the series’ upcoming locations include Chesterman and MacKenzie beaches in Tofino (June 16 & 17), Cadboro Bay in Victoria (July 7), Jericho Beach in Vancouver (August 11) and Kalamalka Lake just outside of Vernon (August 25 & 26). “There are beautiful venues to paddle across BC, and the geographical variety is fantastic. In Tofino, there are the small waves and surf, while in Victoria you’ll experience sea birds, wildlife and unpredictable tide movement. The series offers a bit of everything and each race is different,” says Tim Quarles, one of four people now sitting on the BC SUP Cup’s organizing committee. Race leaders Mike Darbyshire and Evan Gerbrecht rounding the navigation marker off Willows Beach last year. Photo courtesy Bluegiraffe Photography. Also adding to the series’ uniqueness is that each event has a different format. 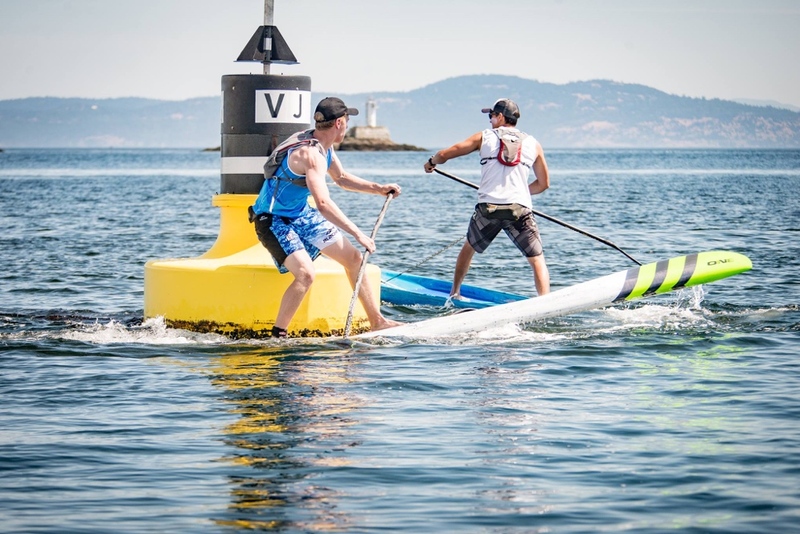 This year, there are three distance races ranging from 12 kilometres to 17 kilometres and two technical events that focus on an athlete’s SUP skills. The BC SUP Cup has grown in participation since its launch — last year saw 259 athletes take part, which is impressive, considering SUP was still an obscure sport just seven years ago. Quarles remembers the initial SUP boom across BC in 2012, and he says new technologies like inflatable boards and kid-specific boards are making the sport more accessible and popular. He also believes that part of its appeal is that it’s unlike any other paddle sport. While the BC SUP Cup events are designed to appeal to recreational athletes, the series also attracts more professional athletes. Lina Augaitis, a semi-professional SUP athlete based in Vernon — who also sits on the BC SUP Cup Series organizing committee — joins in the events when her busy racing schedule permits. She first tried the sport in 2010 and is now an internationally ranked SUP powerhouse with countless wins and titles under her belt, including 2014 Stand Up World Series Champion and Fastest Paddler on Earth 2014. Lina Augaitis racing in the Kerama Blue Cup, Zamami, Japan, May 2018. Photo courtesy The Paddle League/Georgia Schofield. Today, Augaitis is still racing hard. 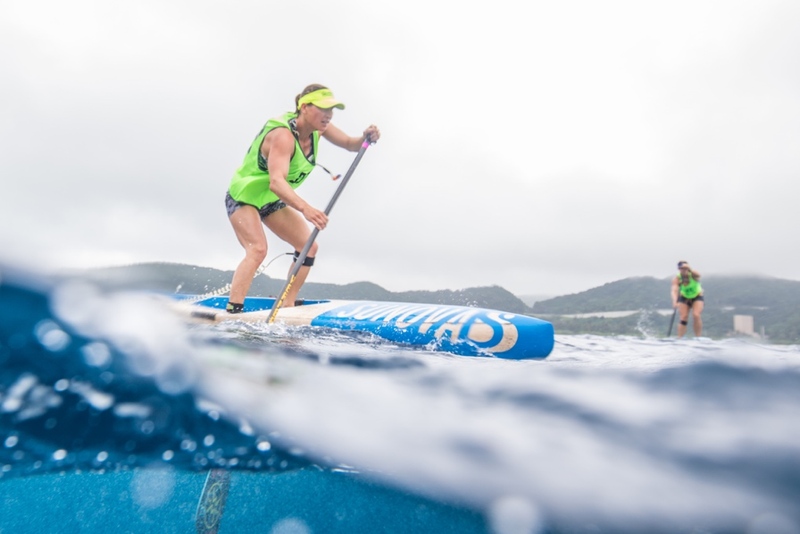 Earlier in May, she competed in the Kerama Blue Cup in Zamami, Japan, placing fourth, and is currently training for a long-distance river event in Tennessee called Chattajack 31, which takes place this October. She’s also aiming to reach the podium at the 2019 Pan Am Games in Lima, Peru. Despite this international focus, Augaitis still loves the BC SUP Cup Series. Augaitis also has goals for SUP in BC beyond her own athletic endeavours, and the series plays a role in achieving those goals. For more information on the BC SUP Cup Series, visit facebook.com/BCSUPCup.